Again, knowledge is trumped (no pun intended) by ideology. As Secretary of State (January 2009-February 2013), with great access to knowledge, Clinton played a key role in the 2011 destruction of Libya’s modern and secular welfare state, sending it crashing in utter chaos into a failed state, leading to the widespread dispersal throughout North African and Middle East hotspots of the gigantic arsenal of weaponry that Libyan leader Muammar Gaddafi had accumulated. Libya is now a haven for terrorists, from al Qaeda to ISIS, whereas Gaddafi had been a leading foe of terrorists. The Western intervention in Libya was one that the New York Times said Clinton had “championed”, convincing Obama in “what was arguably her moment of greatest influence as secretary of state.”2 All the knowledge she was privy to did not keep her from this disastrous mistake in Libya. And the same can be said about her support of placing regime change in Syria ahead of supporting the Syrian government in its struggle against ISIS and other terrorist groups. Even more disastrous was the 2003 US invasion of Iraq which she as a senator supported. Both policies were of course clear violations of international law and the UN Charter. 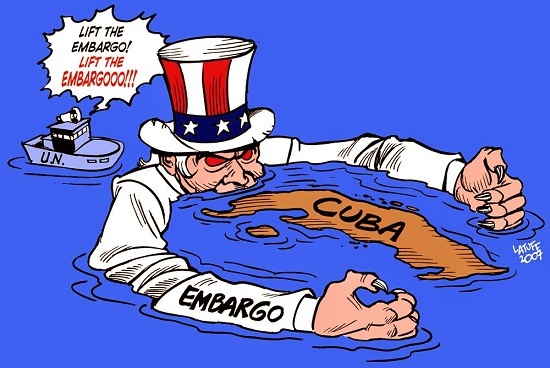 In 1999 a Cuban lawsuit demanded $181.1 billion in US compensation for death and injury suffered by Cuban citizens in four decades “war” by Washington against Cuba. Cuba asked for $30 million in direct compensation for each of the 3,478 people it said were killed by US actions and $15 million each for the 2,099 injured. It also asked for $10 million each for the people killed, and $5 million each for the injured, to repay Cuban society for the costs it has had to assume on their behalf. This article was posted on Friday, March 11th, 2016 at 4:15pm and is filed under "Aid", CIA, Crimes against Humanity, Cuba, Democracy, Grenada, Honduras, Human Rights, Libya, Militarism, Occupy movement, Sanctions, War Crimes.